The Moscow Kremlin is the oldest part of Moscow, the main socio-political, historical and artistic complex of the city, the official residence of the President of the Russian Federation. The history of the Kremlin began in the XII century, when the first settlers built a Krivichi Borovitsky hill – a small wooden fortress that repeatedly burned, rebuilt, was exposed to enemy raids. Having to stay wooden and white stone, the fortress took the form familiar to us only at the end of the XV century. It was made by Italian architects. Tsar Ivan III delineated border fortresses and erected buildings, which determined the look of the old Kremlin: the Faceted Chamber, Dormition, Archangel and Annunciation cathedrals. Since then, the city is guarded twenty watchtowers. Ivan III ordered to create a defensive moat area. In its place it was at first just a market. For reasons of fire safety in the area it can not be built out of wood, but were allowed to sell products from the hands and from the shops. Then the place became known as trading. Red Square nicknamed not by the color of the walls of the Kremlin, but for the exceptional beauty. Tsar Alexei Mikhailovich first did it. Before the XIX century began, despite all the measures it is regularly burned, that’s why it received another nickname – Fire. 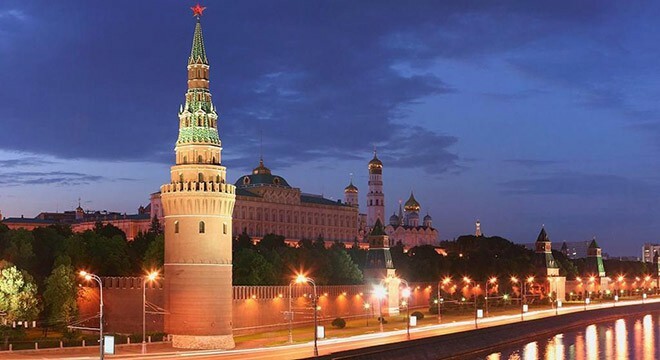 After becoming a stone, Red Square, practically ceased to change: from one year to beat the clock on the Spasskaya Tower, in the twilight of the Diamond Fund of sparkling jewels, and on holidays in the Red Square parade takes place. Before becoming an open-air museum, the Moscow Kremlin has long remained a residential – until 1961, when the last inhabitants left out. The population went from the Kremlin in the XI-XII centuries, when the craftsmen and merchants moved to put behind its borders. The official residence of the princes of Moscow Kremlin became only the second half of the XIII century, and at first settled inside it, not only members of the aristocracy. Until the establishment of Soviet power entrance to the fortress, it was free. The last Russian emperors rarely came to Moscow residence, so, taking a free ticket, you could even walk through all of the Kremlin Palace. After the October Revolution in the Kremlin all monks and church officials were evicted, and demolished Voznesensky and Chudov monasteries. Together with Lenin in the fortress settled members of the Higher Party and their families, protection of workers and the military. Populated were not only palaces, but also the Kremlin towers, churches and even Ivan the Great Bell. After Nikita Khrushchev’s orders the Kremlin began settle and at the same time re-opened to visitors. It happened in 1955. In 1991, the Kremlin became the residence of the President of Russia Federation. In the 1990s in the Kremlin conducted major restoration work, which resulted in the restored Red Porch Faceted Chamber, Alexander restored and St. Andrew’s Hall of the Grand Kremlin Palace, the Senate building were restored. In July 2014, President Vladimir Putin proposed to demolish the administrative 14th Corps on the Ivanovo area of the Kremlin and restore the Chudov and Ascension Monastery.